04.24.2006 - The Corn Snake, Elaphe guttata guttata, is probably the 2nd most common snake that I find and remove here in Central Florida. I consider it the prettiest snake that I deal with. It has a beautiful red and orange pattern, and the belly is white with black keyboard markings, from which it gets its name (apparently the markings look like maize, although I'd have named this snake the piano snake on the basis of its belly). Many people associate brightly colored animals with poison, and it's true that many critters in nature that choose to stand out via their coloring are poisonous. This is named aposematic coloration. The most common configuration amongst animals is camouflage, and is called cryptic coloration, with good reason, and so brightly colored critters, who stand out and are easily spotted by prey, generally want to stand out, to call attention to fact that if they do get attacked or eaten, it will be an unpleasant meal. But not the Corn Snake, it's harmless. However, I understand why so many people assume that it's a dangerous snake. As usual, I simply stroll up to it like the big brave man I am, and pick it up and give it a gentle caress. The fact of the matter is that this snake is one of the most docile snakes in Florida. I've only seen on bite once, and that was when the guy swung it in circles by its tail, and it retaliated. I always treat snakes gently and respectfully, and they don't bite. This snake is so pretty and docile, in fact, that it was one of the very first snakes to be kept in captivity, and its still one of the most popular pet snakes. The corn snake is a popular pet due to its docile nature. These snakes receive their names because of their frequency around corn cribs. Small rodents would sneak onto a farm to eat the corn and the corn snake would be waiting to eat the rodent. These snakes are nonvenomous and have an attractive pattern. They are found in both warm and temperate climates, preferring thick woods or overgrown areas of vegetation. In regions where the winters are cold, corn snakes will hibernate. Breeding takes place after a period of brumation and results in a dozen or so eggs. After ten weeks, the baby snakes use a special egg tooth to break their way through the outer shell. Like all reptiles, snake young are on their own immediately after hatching. Corn snakes can be particularly difficult to identify because of the wide range of colors and sizes they are found in. There are over thirty color variations, some adding to the mix with pattern variances as well. 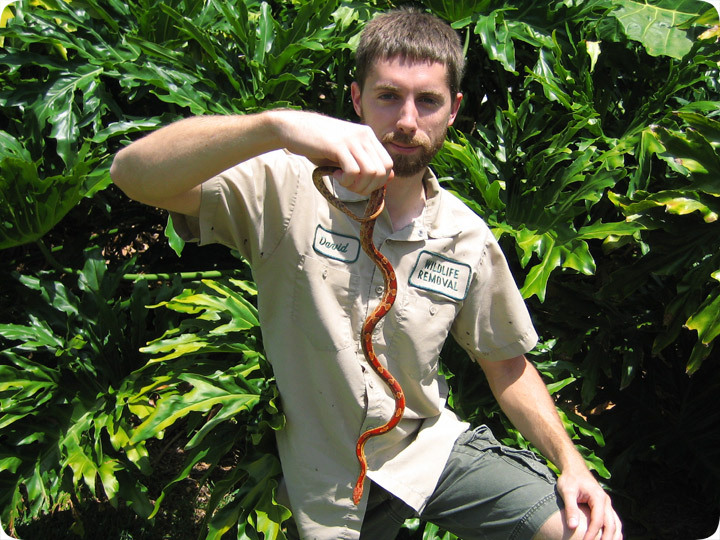 Corn snakes are also known as red rat snakes or just rat snakes. Unlike other snakes of its size, it uses constriction to weaken its prey prior to ingestion.